I posted an off-hand tweet today that turned into a powerful teaching moment. I’ma share it with you in a minute. Pat’s a super-successful dating coach; I used an important principle he teaches as the basis for one of the most important chapters in my book. Anyway, Pat’s of the opinion that not being on social media is bad for business. But it depends on the business. We give up a lot of time and energy to social media. Time and energy that we can spend creating less ephemeral, higher quality, evergreen assets. That was the end of it, or so I thought. Until today, when I decided to look up Victor Pride’s traffic numbers. And the blog isn’t his only digital property. He also has his podcast and Youtube channel. And he doesn’t just sell ebooks. He sells private label supplements, does affiliate marketing, and occasionally does events. I’d say he does about $50 – $80k a month altogether. I was making conservative estimates like for B&D, mainly on the Google Adsense. They do some affiliate marketing too. And they may have private donors and direct ad buys. So their numbers could be similar to Victor Pride. 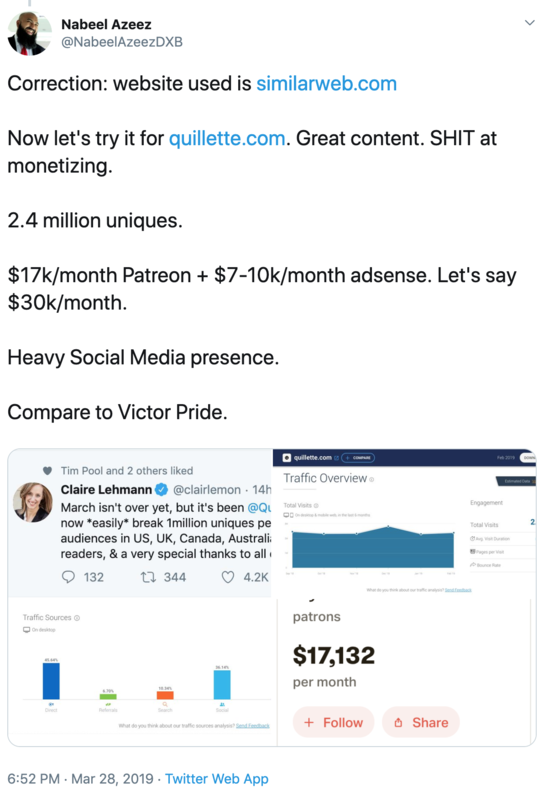 But Quillette gets FIVE TIMES as much traffic as B&D. They should be doing 5x the revenue. To drive the point home from another angle, let’s take a look at someone with a massive social media signal. Only 0.1% of the people who see Ed’s social media posts come to his website. 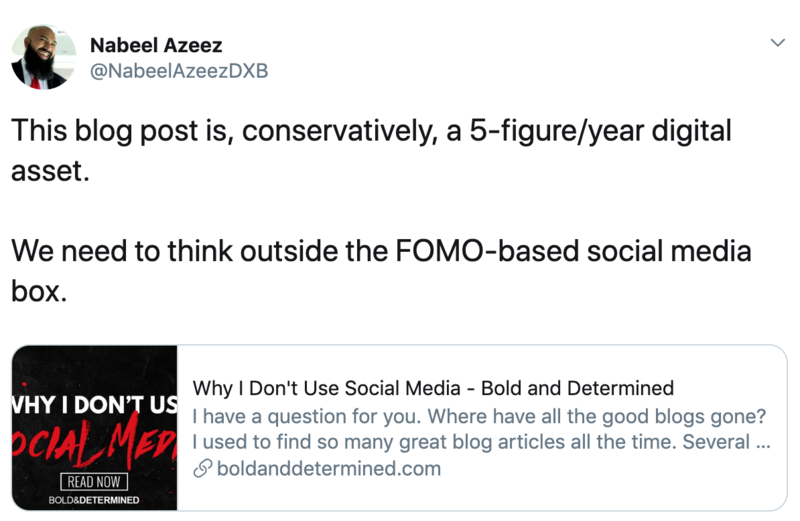 Ed spends maybe 2-3 hours a day on social media? Maybe more? That’s a lot of time and energy invested for a tiny return. School is in session, bros.
You just learned how to make money online. P.S. You know what else Victor Pride has? An email list! Only 3 days left for you to sign up for ConvertKit’s 30-Day Landing Page Challenge and have a chance at winning $5,000. 1 year quarterly coaching with an account manager = $1,000 est. not a resident of Brazil, Mexico, Italy, Quebec, or any country, state, province or territory under sanction by the U.S. Office of Foreign Assets Control, including the Balkans, Belarus, Burma, Cuba, DR of the Congo, Iran, Iraq, Lebanon, Libya, North Korea, Somalia, Sudan, Syria, Yemen, and Zimbabwe. To sign up for the challenge, click on this link. Get a free chapter of my new book, Dragon Energy: The Tao Of Personal Branding, when you subscribe to my daily email newsletter. SimilarWeb is notoriously inaccurate as far as traffic goes, SEMrush (the original one you pointed out) is better, but only shows actual SEO data (which is in the shitter as of late, thanks Google/DDG) – and isn’t relevant to the actual people visiting via their RSS feed or any other methods used for tracking. Not sure what SimilarWeb includes, but I’ve never seen a truly accurate assessment (for any of my sites, or any other’s). Regardless, you’re spot on in this post. It’s still very much a viable medium, which is why I keep doing it – and really, I need to do more of it. Less social media where anyone can shout into the void, and more growing the evergreen assets that are going to keep bringing you leads and sales overtime. 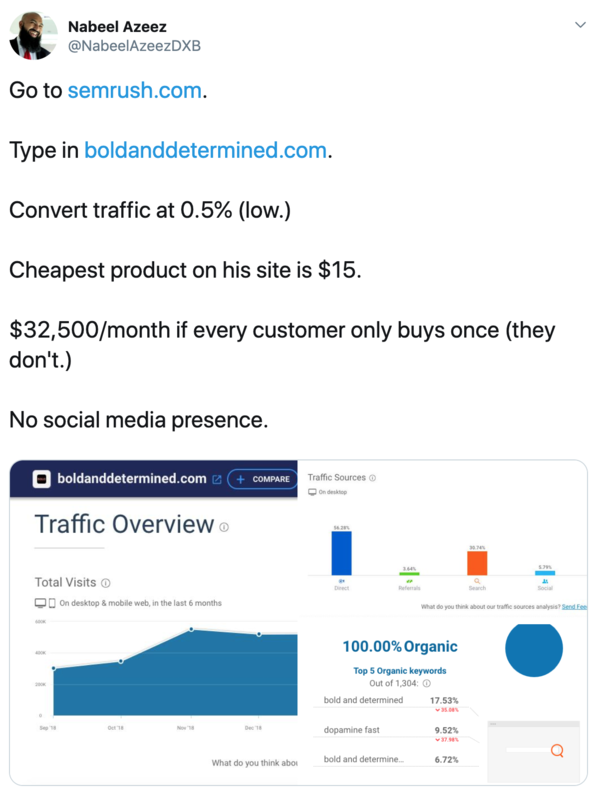 0.5% to completely cold traffic, in the hopes they just buy one of his books, is actually probably a bit…high. But, I’d wager 0.5% do buy something (whether it be an affiliate product or something else). And, his articles are top-notch. Once someone reads one once, a lot will keep coming back, and buy eventually. Difficult to track and get all the real numbers on this as the site owner, much less us speculating here. Glad you chimed in bro. You have more experience evaluating websites than me. What’s the most accurate tool? Ahrefs? I actually think SEMrush is pretty accurate as far as showing Google rankings/volume/etc. It’s as close as you’ll get as far as the search engines. Unfortunately there’s no way whatsoever to measure how many RSS readers or people who just have a site bookmarked without having access to returning visitor data.